A 42-year-old perimenopausal female presented with complaints of insidious onset right sided facial weakness, tinnitus and decreased hearing of 2 months duration. There was no recent history of upper respiratory tract infection or aural infection or trauma. No history of vertigo. On examination, she had Grade I to II right sided motor facial palsy. Sensory and secretomotor divisions were intact and minimal right hypoglossal nerve paresis seen. All other cranial nerves were normal. Otoscopic examination was unremarkable. Tuning fork test was suggestive of right sided sensorineural hearing loss (SNHL). Pure tone audiometry showed moderate to severe SNHL in right ear. Impedance audiometry and stapedial reflex for both ipsi and contra lateral ears were normal. Vestibular system examination was normal. Tinnitus was subjective in nature. Computerized tomography (CT) scan and magnetic resonance imaging (MRI) scan was performed [Figure 1] and [Figure 2]. 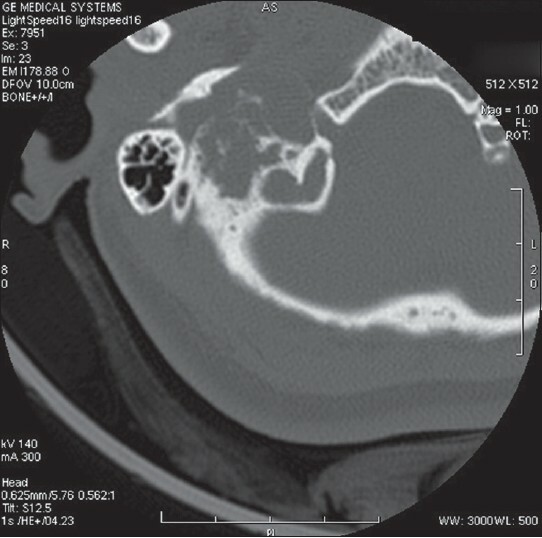 Computerized tomography picture [Figure 1] demonstrated permeative erosion of the jugular foramen (JF) with popcorn calcification. MRI picture [Figure 2] demonstrated an ill-defined lobulated extra axial lesion, appearing heterogeneously hyper intense on T2-Weighted images and showing heterogeneous postcontrast enhancement, in the right JF region. The internal jugular vein (IJV) is not visualized in the region of JF and beyond. Right sigmoid sinus was not visualized proximally. 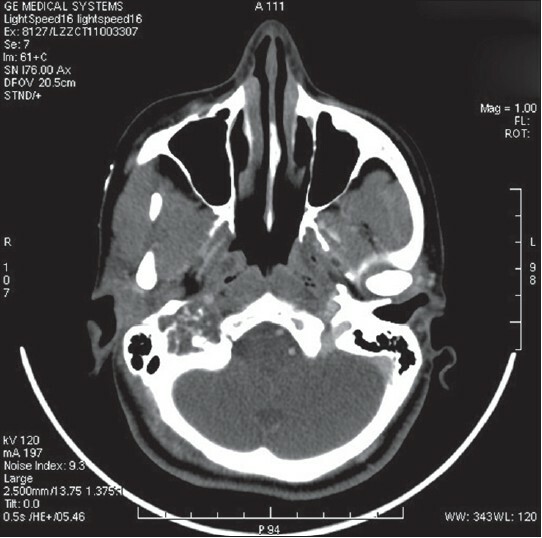 The lesion was present medially in the hypotympanum, extending posteriorly into the mastoid, abutting sigmoid sinus and medially abutting the hypoglossal canal and showed patchy post contrast enhancement. CT angiography [Figure 3] showed minimal contrast enhancement in all phases of angiogram, and the jugular bulb was completely occluded with disease abutting the hypoglossal nerve. With a provisional diagnosis of chondrogenic tumor, the patient was taken up for surgery. A C-shaped postauricular incision was taken 2 cm posterior and parallel to the groove and extended it into the neck. 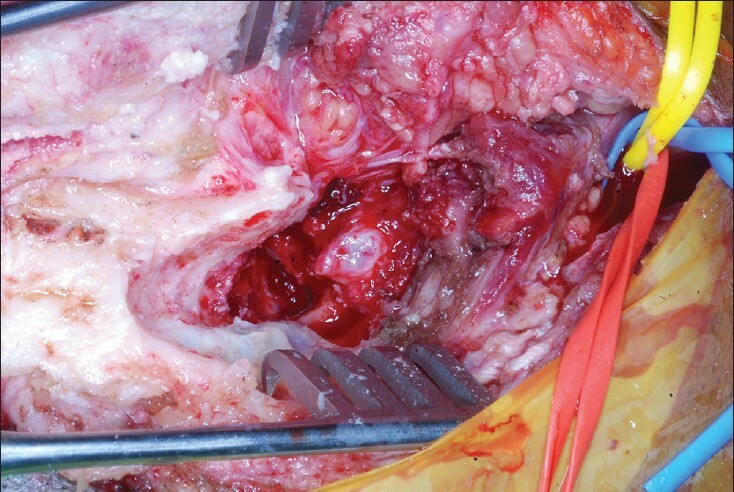 Upper part of the neck dissected and mobilized nerve monitors were used intraoperatively. A 2 × 2 cm bony lesion was excised from the region of JF, which was pressing on the facial nerve trunk near the stylomastoid foramen but, was free from the adjacent structures. IJV was well preserved, facial nerve was dissected free of the tumor and all other lower cranial nerves were identified and preserved [Figure 4]. Histopathology was reported as chondrosarcoma (CSA) Grade II. Immunohistochemistry-stained positive for S-100 protein and vimentin. In a retrospective study, they found that the common symptoms of dysphonia and dysphagia were because of lower cranial nerve compression. Aural tinnitus and hearing loss are a common presentation in other more common JF lesions like meningioma and glomus jugulare. Facial nerve involvement is an uncommon feature of CSA or any other JF lesion as the nerve trunk is not a close anatomical relation to JF. Sanna et al. 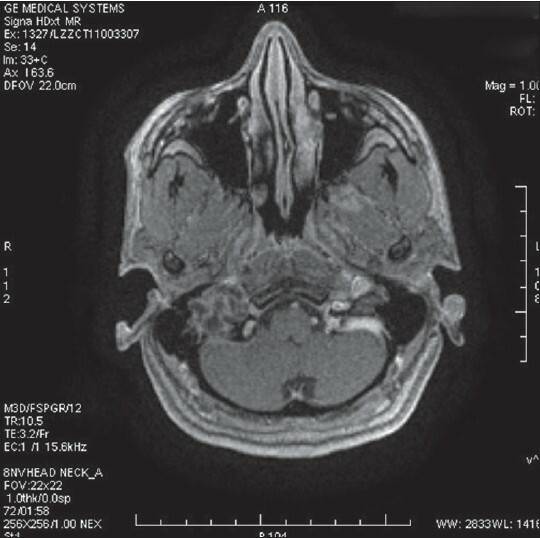 who has the largest published series of five cases of JF CSA did not find VII CN involvement in any of his cases; this was rather an atypical finding which was attributed to the lesion compressing on the facial nerve trunk near the stylomastoid foramen as it exited the temporal bone. Histopathologically, CSAs are divided into the following subtypes: Conventional (myxoid and hyaline types), dedifferentiated, clear cell, and mesenchymal with the conventional form being the most common type within the skull base. Dedifferentiated and mesenchymal CSA variants are more aggressive and may metastasize, but account for <10% of all skull base CSAs. Rosenberg et al. further subdivided the conventional type into three grades based on cellularity, nuclear size of the cells, chondroid matrix, and nuclear atypia: well differentiated (Grade I), moderately differentiated (Grade II), and poorly differentiated (Grade III). Conventional type Grade I variety is most common followed by Grade II. CSA of the skull base is frequently misdiagnosed histologically as chordoma, especially the chondroid variety of chordoma. Immunohistochemical analysis is particularly helpful to differentiate chordomas from CSAs. Chordomas stain positively for epithelial membrane antigen, cytokeratin, vimentin, and S-100 protein. In contrast, CSAs stain positively only for S-100 protein and vimentin. Surgical excision is the treatment of choice for chondroid tumors of skull base. 1. Sanna M, Bacciu A, Pasanisi E, Piazza P, Fois P, Falcioni M. Chondrosarcomas of the jugular foramen. Laryngoscope 2008;118:1719-28. 2. Kryzanski JT, Heilman CB. Clinicopathologic features of jugular foramen tumors. Oper Tech Neurosurg 2005;8:6-12. 3. Katoh M, Tada M, Sawamura Y, Abe H. Total removal of huge chondrosarcoma of the skull base with facial nerve resection and reconstruction. J Clin Neurosci 1998;5:342-5. 4. Ong CK, and Fook-Hin CV. Imaging of jugular foramen. Neuroimaging Clinics of North America,2009; 19:469-82. 5. Rosenberg AE, Nielsen GP, Keel SB, Renard LG, Fitzek MM, Munzenrider JE, et al. Chondrosarcoma of the base of the skull: A Clinicopathologic study of 200 cases with emphasis on its distinction from Chordoma. American Journal of Surgical Pathology, Nov 1999;23:1370.